Towards the end of December, I decided to hit the ground running with my boys doing a little pre-school schooling. They were getting bored and restless and I find them happiest when they are engaged in specific activities which either holds specific meaning or a whole lot of fun. Kudos if you can combine both (which is what I'm attempting to do!) 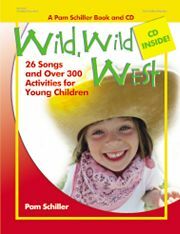 To that end, I pulled out is the Wild, Wild West thematic unit which I reviewed some time back, stating that I intended to use it when Bookworm1 was older. Well, now he's older and now we're using it! I pulled out a planner, started making notes and wrote out our day-to-day activities and we were off and running. Of course, one of the greatest resources I think that there is when teaching youngsters is The Picture Book. Put some facts into a story and you are well on your way to engaging their imagination while informing them about the world around them at the same time. I picked out a few titles on Amazon, picked up a few books at our local used book store and then raided the library. (Stay tuned for more about the library near the end of this post.) Here is just one title that I picked up on Amazon because I thought we'd like it well enough to want to keep it. 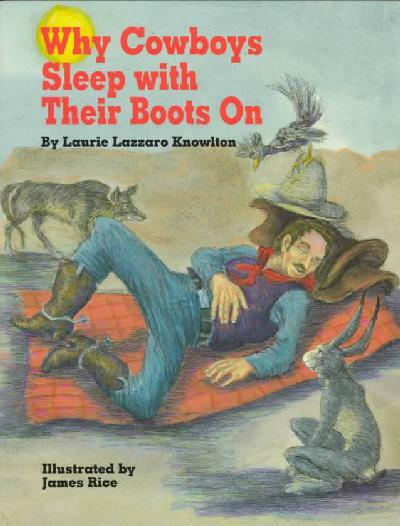 One of the books recommended in this thematic unit was Why Cowboys Sleep With Their Boots On , by Laurie Lazzaro Knowlton. Slim Jim Watkins is a "hardworkin', lasso-wieldin' cowhand" who makes the unfortunate decision to remove various items of clothing before he goes to sleep at night, out under the starry blue sky. Taking advantage of his carelessness, several animals come along and steal his possessions. Through the story, we discover why it is important that Slim Jim have things like britches (he goes to sleep in long johns - no worries! ), a cowboy hat and a bandanna. After a few nights of this tom foolery by the animals, Slim Jim decides the best idea is to sleep with all of his clothes on so that he doesn't risk losing these valuable cowboy clothing items. Very cute and I am glad I purchased it. I found a copy of Jim Arnosky's All About Rattlesnakes at Goodwill for a mere $0.99! That was a deal I certainly couldn't pass up. Arnosky is a magnificent illustrator who loves introducing youngsters to life in the animal kingcdom. His "All About" series is educational and interesting. 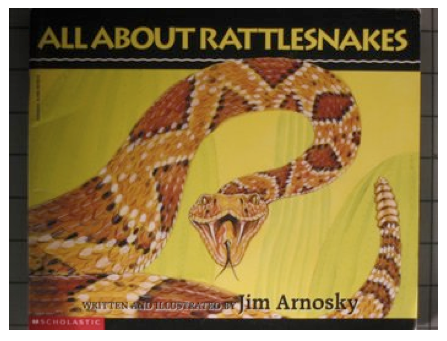 Of course, you can't talk about the wild, wild west without discussing rattlesnakes now, can you? I wrote up a post yesterday and again today sharing some other western-themed picture book titles that we have been using, courtesy of our local library. To find out more about that, visit Reading My Library. As I invite you to do over at Reading My Library, if you have any additional western-themed children's books that you would recommend, please leave a note! I'm on the prowl. Very cool! It's great that you found a series of books and a unit that will help all of you and be fun. Do you have plans for after this unit? If not, Hubbard Cupboard (free) is great, and Itty Bitty Curriculum looks great! How fun!! Right now we are studying bats and Benjamin Franklin. I've brought home nearly 50 books from the library on the 2 topics. :) So glad for a library!!! We're also going to take a couple of field trips in the next 2 weeks. We LOVE Arnosky books! You may borrow our copy (it's out of print) of Way out West With a Baby by Brownlow. Cowboys find baby and return it to wagon train.